Four days ago Pope Benedict XVI delivered an address to some of the3 scientists at the University of Regensburg, Germany. The Pope, then Joseph Alois Ratzinger was a professor and vice rector at the University from 1969 to 1971. The title of the speech was "Three Stages in the Program of De-Hellenization", and it's main focus was just that. The subject matter is very esoteric and academic, and I do not have the knowledge to understand most of what he is saying. The Pope is quite clearly very learned, as must be anyone who hopes to understand his address without doing additional research. In this lecture I would like to discuss only one point -- itself rather marginal to the dialogue itself -- which, in the context of the issue of "faith and reason," I found interesting and which can serve as the starting point for my reflections on this issue. In the seventh conversation ("diálesis" -- controversy) edited by professor Khoury, the emperor touches on the theme of the jihad (holy war). The emperor must have known that sura 2:256 reads: "There is no compulsion in religion." It is one of the suras of the early period, when Mohammed was still powerless and under [threat]. But naturally the emperor also knew the instructions, developed later and recorded in the Koran, concerning holy war. Without descending to details, such as the difference in treatment accorded to those who have the "Book" and the "infidels," he turns to his interlocutor somewhat brusquely with the central question on the relationship between religion and violence in general, in these words: "Show me just what Mohammed brought that was new, and there you will find things only evil and inhuman, such as his command to spread by the sword the faith he preached." The emperor goes on to explain in detail the reasons why spreading the faith through violence is something unreasonable. Violence is incompatible with the nature of God and the nature of the soul. "God is not pleased by blood, and not acting reasonably ("syn logo") is contrary to God's nature. Faith is born of the soul, not the body. Whoever would lead someone to faith needs the ability to speak well and to reason properly, without violence and threats.... To convince a reasonable soul, one does not need a strong arm, or weapons of any kind, or any other means of threatening a person with death...."
Here we go again. This past January and February we had the "Cartoon Jihad", during which several of us here in Washington DC, sponsored by FreeRepublic.com, felt obliged to go down to the Danish Embassy to act as "human shields" against radical Muslims. In July Muslims were outraged! when Israel had the audacity to respond to Hezbollah rocket attacks by striking targets in Lebanon. NABLUS, West Bank — Palestinians wielding guns and firebombs attacked five churches in the West Bank and Gaza on Saturday, following remarks by Pope Benedict XVI that angered many Muslims. On Friday, Pakistan's parliament adopted a resolution condemning Benedict for making what it called "derogatory" comments about Islam, and seeking an apology. ISTANBUL -- Across the Islamic world yesterday, Benedict's remarks on Islam and jihad in a speech in Germany unleashed a torrent of rage that united Shi'ites and Sunnis and threatened to burst into violent protests like those that followed publication of caricatures of the prophet Muhammad. ANKARA Turkey - "Anyone who describes Islam as a religion as intolerant encourages violence," (Turkish) Foreign Ministry spokeswoman Tasnim Aslam said. BEIRUT, Sept. 15 -- A medieval reference in an academic lecture by Pope Benedict XVI unleashed a wave of denunciations, outrage and frustration across the Muslim world Friday, with officials in Turkey and Pakistan condemning the pontiff, Islamic activist groups organizing protests and a leading religious figure in Lebanon demanding that he personally apologize. 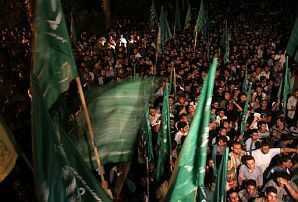 Palestinian Hamas supporters wave party flags as they shout slogans against Pope Benedict XVI during a demonstration in Gaza City, Friday. The Catholic League contacted editors of The Cavalier Daily about two cartoons published in August. One of the cartoons, printed Aug. 23, depicts Jesus crucified on a graph with the caption "Christ on a Cartesian Coordinate Plane." The other, printed Aug. 24, shows Joseph asking Mary, "How did you get that bumpy rash?" Mary replies, "I swear, it was Immaculately Transmitted." Another cartoon printed Aug. 24 depicts Jesus driving a woman in a car that presumably crashes. As they wait in line at Heaven's pearly gates, the woman curses at Jesus, who responds, "B****, I ain't never drove!" Whether you think the Cavalier should have removed the cartoons and apologized or not is beside the point. 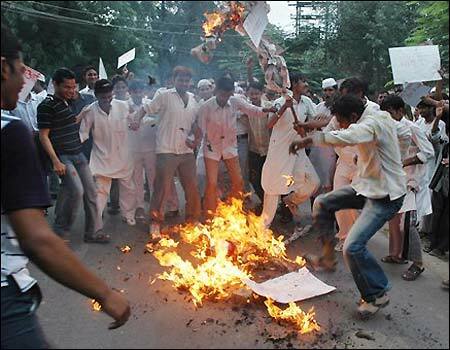 There have not been any riots by Christians nor will there be. No one is going to bomb anything at the University of Virginia. In the West we have learned how to handle these things peacefully. In most of the Islamic world they have not. The problem with Benedict's speech, and it's illustrated perfectly by the quotation I cited above ("...evil and inhuman..."), is that it gives moderate Muslims no option other than to renounce our faith. When Benedict approvingly cites a source who says that Islam is "evil and inhuman", he's not offering a bold challenge to moderate Muslims, he's alienating them. There is a profound difference between, on the one hand, endorsing what Benedict said, and on the other, calling the enemy "militant Islamists", "Islamofascists", "Islamobolsheviks" (my personal favorite), or whatever. It's the difference, I suppose, between Robert Spencer and National Review, JihadWatch and AEI. Just because the Muslim street is, in all its hypersensitivity, reacting like a woman who's just been told her pants make her look fat doesn't mean that Benedict was correct to say what he said, certainly not from the perspective of history and theology, nor I believe from that of the best way to win the GWOT. Professor Bainbridge (via Michelle Malkin) sees the Pope's address more as " a shot across the bow of post-Christian Europe", telling them that they have lost their way and as such "the tools demanded to meet the threats of the day"
...to see this speech solely in terms of a clash of civilizations between Christianity and Islam would be error. Instead, the Pope is staking out a set of claims about the relationship of man and God that stand in opposition not only to the Islam of Ibn Hazn, but also that of the Protestant Reformers, the Jesus of History crowd, and (an area of particular concern for this pope) post-Christian Europe. The Pope is also renewing the claims of the Church Universal to have a truth that is transcendent, rather than culturally-bound. But the inclusion of that sentence by the Pope is also not that big of a deal. And unlike Jesus, Mohammed did spread his faith through the sword. This is a central fact that many Muslims like to ignore. The West, on the other hand, self-flaggelates all the time over it's history. We wash our dirtly laundry ad nauseum, usually for the better. Other cultures have not faced up to their historical misdeeds, and not doing so results in a fantasy view whereby they are perfect and the West evil. Further, President Bush and other Western leaders need to speak out on this matter, not to defend the Pope, but more to defend free speech from violence and threats of violence. They should denounce the actions of the Turkish and Pakistani parliaments. This sort of nonsense from the Times only encourages the Islamists to riot and carry on like this. We can't become "insult free" here in the West. The real world doesn't work that way. We can't go on with these riots every time some Muslims feel they have been offended, which seems to occur and more and more frequent intervals. The best way to stamp this down is not to pander to it, but to tell those engaged in such "outrage" to grow up and handle their offendedness in a more appropriate manner. As Michelle Malkin points out, "there is always an insult to be manufactured"
When will any Muslim cleric apologize to Christians or Jews over the ant-Christian and anti-Semitism that is a regular feature of the Middle East? I am sick of "Muslim rage" over this or that. No doubt there are Muslims who are disgusted by their brethren who act in this manner. I suspect the main reason we don't hear from them like we should is that they are afraid of violence directed at them. Khomeini, Kurdistan: An excerpt from "The Foreigner's Gift"
... an important outsider had turned up in Iraq: a religious scholar in his midforties, Sayyid Hussein Khomeini, a grandson of the late Ayatollah Khomeini. In an episode of supreme irony, this man of impeccable pegigree arrived in Najaf from Iran --- to preach the virtues of secular rule. Iran, he told the Iraqis, was suffocating under the rule of clerical obscurantism. He described a reign of mediocrity and repression in his native land --- the intelligence services loose in the holy city of Qom and its seminaries, the lack of channels of free expression. Despite his very special pedigree, he had not been allowed access to the media. There was nothing odd, he said, about his opposition to his grandfather's notion of clerical rule. The old man himself, "Imam Khomeini," had taken up the notion of wilayat al-faqih only late in life, when he was in his fifties. The world changes, and men change with it: the notion of Islamic rule had played out in Iran and had failed. Hussain Khomeini told of a letter he had sent to the "Supreme Guide of the Islamic Republic," Ayatollah Ali Khamenei, putting before that man the internal and external problems of the regime. He had described unsparingly the disaffection at home and Iran's isolation abroad. He called for a plebiscite that would ask the people of Iran to let it be known, in an open manner, whether they still wanted theocratic rule. Let the ballot decide, he had written to the clerical leader. If the theocracy failed at the ballot box, the men of religion "would go back to their homes, and change would come without bloodshed." The revolution, he had told its clerical leader, had been "hijacked," "stolen," and it was time to press for the separation of religion and politics. A witness had thus come to Iraq from the very apex of the Iranian system. He congratulated the Iraqis on their new liberty. In an astonishing break with his grandfather's legacy, young Khomeini even spoke well of the Americans. The new liberty, he reminded Iraqis, was a gift of the Americans. There was nothing in Iran, he lamented, save sterility and misery. There was nothing to emulate in Iran: it was up to the Iraqis to build a better polity of their own. Hussain Khomeini was an unusual man: he would not take the bait before him when asked the obligatory question about Israel. The matter of Israel, he said, needn't concern Iranian and Iraqis. Reform, modernity, economic progress: these were the themes that mattered. It was important, he reiterated, that the principle of theocratic rule be turned back, that the harm it had done to Shiism be faced and acknowledged. Knowledge of a different kind of Iraq and about Iraqis came to me when I went north to Kurdistan. I flew with then Deputy Prime Minister Barham Salih to his hometown and political base in Suleimaniyah. This political leader and technocrat, born in 1960, the son of a judge, had made his mark in that part of the country in the Kurdish regional government. He had known brief imprisonment under the Baath, then had made his way to Britain, where he completed a doctorate in statistics and computer modeling. Having represented the Kurds in London and Washington, he knew the world beyond the hill country of Kurdistan. He spoke Arabic, Kurdish, and English with equal ease. A can-do man and an optimist of enormous will and talent, he had left his base in Suleimaniyah to be part of this interim government. He was going to visit his family and be with his mother and to call on his political leader, Jalal Talabani. After the checkpoints and the gunfire and the mortors of Baghdad, the tranquility of Suleimaniyah came as a surprise. There was peace in the streets and normalacy, a boom of sorts in the building trade, houses going up everywhere, a public park with gardens and a lake where Iraqi military barracks and facilities had once stood, a sunlit library of exquisite design with books tumbling out of the shelves, computer terminals, a children’s reading room. A kind of modernity was being grafted onto the place, the peace of a people who know that fate can turn cruel at any time. The independence of this world was made clear to me on an evening drive into the hills to visit Jalal Talabani. A narrow road snaked into the mountains. The hills below and around looked majestic, stark, and endless. These hills would be wild with vegetation come spring, I was told. Fog was blowing in, and it was getting cooler. At the roadside, families had congregated for picnics and dinner. There were fires being readied for the preparation of the meals. There was no privacy here, and no great need for it. Talabani’s heavily guarded residence was elegant but within the bounds of taste. This was no place in the Saudi mold and size. A gregarious, overpowering man in his mid-seventies, Talabani was surrounded by a dozen or so of his colleagues. He filled the gathering with his presence. No host could have been more attentive: he urged more food on me. We sat in his garden under a starlit sky, enveloped by the mountains. The heat --- and the insurgency --- of Baghdad seemed worlds away. There was no trace here of the anti-Americanism that dominates many an evening in Arab lands. Talabani spoke of America and Americans with genuine fondness; he wanted more Americans in Kurdistan. This man had known combat; in his youth, he had been a Marxist. But in his mountain lair, he harked back to an older role, a chief of his people. He took pride in the peace of Kurdistan: a Chinese restaurant had opened in Suleimaniyah, and he took pleasure in that. Indeed, he had some of that restaurant’s dishes added to an already huge dinner. Talabani exuded optimism. In the scramble for this new Iraq, he had a seat at the table. He had his younger colleagues represented in the interim government. But he had these hills, and the town below, and the armed militiamen defending this turf as well; they were what he relied upon. The next day I was to go to the town of Halabja, little more than an hour’s drive away. This was where the Baath despotism had committed mass murder with chemical weapons in 1988; the Kurds had turned the place into a monument of Kurdish sorrow and memory. The landscape alternated --- patches of green, fields of sunflower seeds and pomegranates and corn broken by fields of wheat and barley and by the threshing floors of peasants. (I knew and loved these threshing floors from my childhood in Lebanon; politics yielded in my thoughts to the timeless ways of the land.) The villages by the road were forlorn and poor places that the Baath utopia of power and progress had never reached. I had not been prepared for this neglect. I had seen rural poverty in other Middle Eastern lands, but these villages dug into the hillsides with houses of rough stone and flat mud roofs were poor even by those standards. The satellite dishes atop the shacks and the mud houses were an ironic reminder that the “timeless” rhythm of the countryside had been broken. There was something else that broke the rhythm and stood out against the landscape: mosques of a bluish color, large and elaborate, by the shacks. I did not count the mosques, but practically every village had one. They were the gift of the “charities” of Saudi Arabia: the plaques at the entrance to these mosques acknowledged the names of the charities and the donors. Deildar Kittani, a secular Kurdish woman --- with years of education in England behind her --- heaped scorn on these charities. These villages were bereft of roads and clinics and schools, she said, but no one had come to their rescue. This organized religious drive had blown here, bringing disputes and bigotry in its wake. On a clearing at the foot of the hills, a monument to the victims of Halabja had been erected. It was elegant and subdued. Inside --- inspired by the Vietnam War Memorial --- on a black wall were inscribed the names of the five thousand people who perished when the Iraqi Army struck in March 1998. There was installation art and black-and-white photography that honored the dead. The director, a dignified, quiet man, led me through the monument. I then went through the town itself --- a small, bustling place. The commerce in the shops offering the usual fare of out-of-the-way places was an odd consolation that life renews itself. I paid a visit to the cemetery on the town’s outskirts. Rows of neatly arranged headstones suggested method and care. One plot was reserved for a family of twenty-four people who had been cut down that day in 1988. This was the burden of Kurdistan’s --- and Iraq’s --- history. Freedom must be defended ! Today, September 11, 2006, 2,996 volunteer bloggers are coming together for a tribute to the victims of 9/11. Each website will pay tribute to a single victim. We will honor them by remembering their lives, not their murderers. Conservapuppies has been given the great privilege to honor both an innocent victim and true hero, Robert James Crawford. From NYT 11/7/01: "On September 11, 2001 during the performance of his duties as a New York City firefighter (Safety Batallion). He was lost in The World Trade Center disaster while in the process of evacuating civilians." The word “hero” is ubiquitous in today's vocabulary. People use the term liberally for a variety of reasons. Frankly, I think its over usage both degrades and dilutes the power of language. Mr. Crawford knowingly put his life in danger to save the lives of others. His final mission embodied the truest definition of a hero. And according to his profile (see below), he put himself in harm’s way for many years. Jennifer Eppolito has dozens of reasons to call her father, Robert Crawford, great: He would stand outside Brooklyn churches in all kinds of weather, selling raffle tickets to benefit St. Rose's Home, a cancer hospital. When he was honored for his work, he would not want to be in any photographs. He told her, when she was little, "It's more important to listen to what people are saying than it is always to talk." 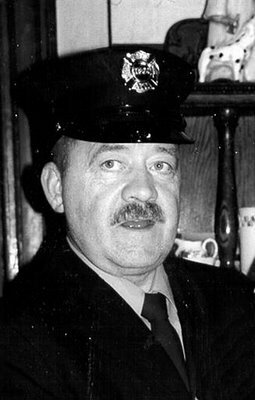 He was a firefighter for 32 1/2 years. "You could ask him about anything, like how does a refrigerator work, and he would be able to sit there and put it into pieces you would understand," she said. When Mrs. Eppolito's daughter, Alexandra, was born, Mr. Crawford took flowers in a vase with the Virgin Mary on it. He taught Alexandra her address by the time she was 2. He called her Poo Poo, and at 62, played Barbies with her. "To describe my father as great, that's not even a good enough word," Mrs. Eppolito said. "I was lucky for him to be my father. There is no other man that, in my eyes, could stand up to him." Our prayers and hopes are with Robert James Crawford and his family. He was obviously a genuine asset to our society and his valor will never be forgotten!